What is it about Otley? 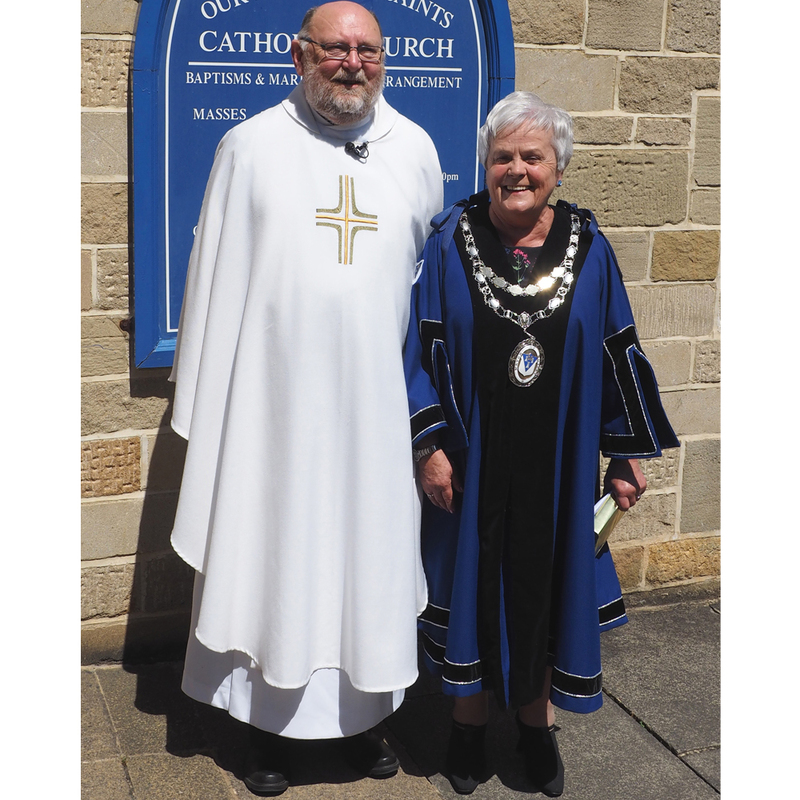 For five out of the last eight years, the Town Mayor has been a Catholic. Indeed, Nigel Francis has served for four years, Ray Smith for a year and the current Town Mayor, Mary Vickers, is just starting her second year. What does she think? “I think that’s a really good thing, I’m proud of that. And other mayors recently have come from the wider Christian Community here in Otley too. It has an impact. People know you are a Catholic. All of our annual Civic Services have been at Mass here in Our Lady and All Saints. We bring in other Mayors from all over Yorkshire, from as far as Wakefield and beyond, so people see our Catholic ethos of more understanding of - and caring for - the community. So how does she want to be judged? “I would like to think that the community will consider that I was a good Town Mayor, that I listened to them. It is up to the community to tell me what they want me to do, to represent the people of the town and help them in any way I can. “For example, I spoke with the market stall holders, because they wanted me to help them develop training for young people. I will work with them to achieve what they want. I visit all the schools so that they know what a Town Mayor does. “Last time I was Mayor, one of my charities was The Sylvia Wright Trust. I’m still involved as part of the Trust. Every year, I go to St Mary’s in Menston to talk to the teenagers about what will be expected of them if they volunteer to work with Sylvia in India, and what help is available for them out there. “Behind Closed Doors is a brilliant charity which helps both men and women who are abused in any way and need guidance and help. They help all ages. They provide refuge, security, counselling, financial help – and it’s ongoing, recognising the need to keep in touch. “The Otley Parish Church Cubs, Beavers and Scouts need help with renovating their Hall at Burras Lane. These children are part of our community and the citizens of the future. I don’t think that fundraising for charities should play a big part in the Mayor’s life, but you do have an opportunity to help them as Town Mayor. “I love Otley, I’ve lived here for 36 years. It’s a beautiful community, a market town, with so much done by the community for the community. For example, for the elderly: a dementia charity, an active singing group, Rotary, Lions, ladies’ groups, Catholic groups like the SVP – an awful lot of groups – and especially Otley Action for Older People, a lot of people who do great work as a team. This church was built thanks to the generosity of the Constable Family. In 1792 The Manor House was built in the grounds of the former medieval Palace of the Archbishop of York. © Copyright 2018. "Website" edited by Our Lady & All Saints Catholic Church. All rights reserved.